Started building a new protoshield for the Arduino that doesn’t use pass-through headers. 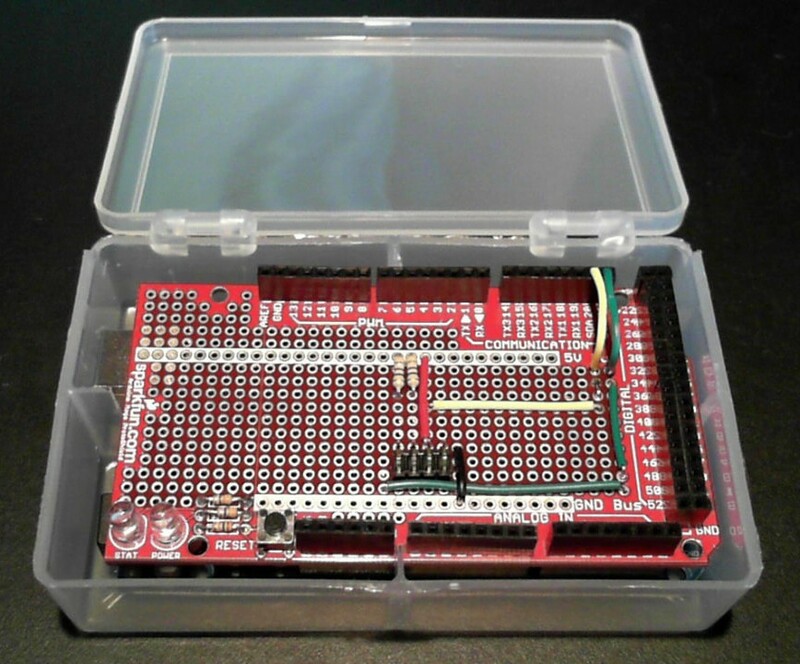 Built a new Arduino box that puts the Arduino further back in the box. This leaves some extra room at the top for a power switch and the power wiring. 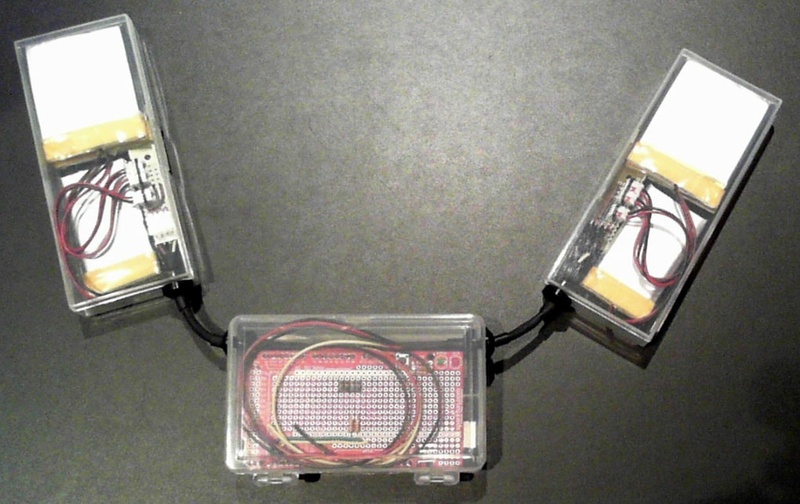 Built most of the two wiring harnesses that link the battery boxes to the Arduino box. I still haven’t hooked up the Arduino side of the power wiring. But I really like the way the strain reliefs turned out. They are, like nearly everything else in anthrolume, a hack. They’re each made out of two rubber faucet grommets that are held in place by heat-shrink rings. The three boxes attach to my belt using industrial velcro (yes, it’s actually called “industrial”). Here’s how the three boxes look mounted on my belt. Today I built the two battery boxes for anthrolume, along with the power boards that consolidate the power within the boxes to four wires. Each box holds three batteries. Of the four outputs, two wires are ground, one wire is the positive of the two big batteries in parallel, and the last is the positive of the single smaller battery. The two boxes are mirror images of each other, to be placed on my belt one on each side of the Arduino box, providing even weight distribution. 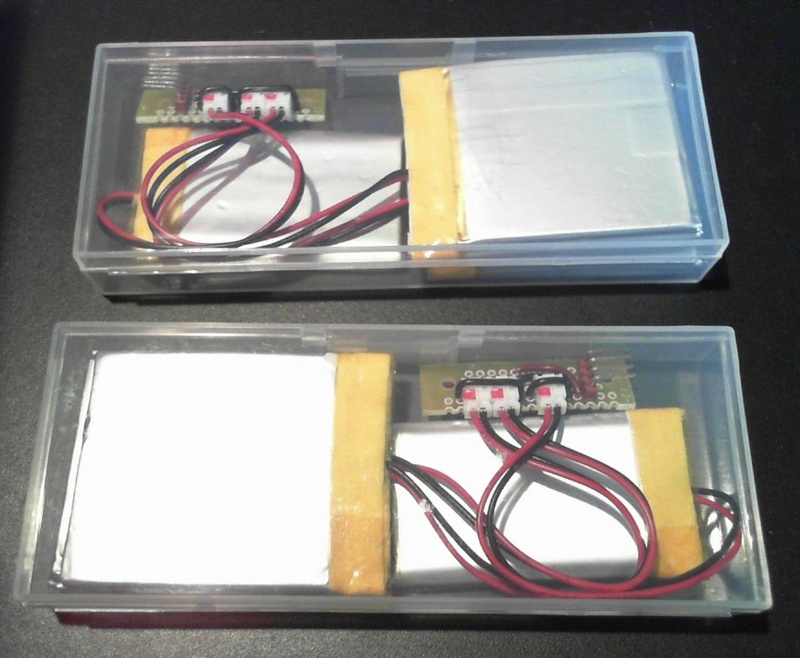 The power from these two boxes will be again consolidated inside the Arduino box to essentially stack the four big batteries into a 4V, 10800mAh power source, and putting the two smaller batteries in series for 7.6V, 1300mAh. The big stack powers the I2C buss with all the LEDs, and the other series batteries run the Arduino, display, etc. I made some changes to the harnesses today on MiniMe to prototype those changes before I make them to the full-size rig. The changes come from my attempts to create a final head+spine buss. The two big changes are that I’ve made the head detachable (that is, it’s not longer part of the spine), and that the spine is now basically just a buss – no LEDs live there. 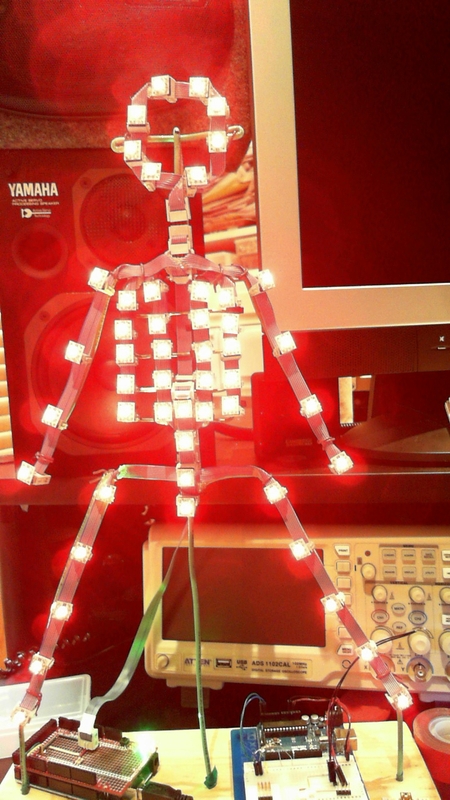 I moved four LEDs off it yesterday (the “lower spine” now its own little harness), so now the spine only serves to connect the head, arms, lower spine, chest, Arduino, and legs (in that order). And since i made that dreadful quarter-scale copper armature for the chest buss, I figured I might as well press the thing into service. Now it backs the chest LEDs, so their spacing is a bit better. Here it is blazing half-brightness red (much more than that will over-current my USB port). 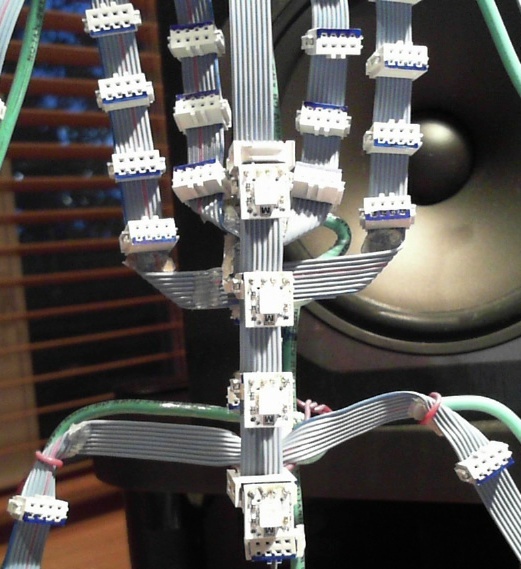 A couple of days ago I got the spine working enough to connect all three harnesses together (arms, legs, and chest). According to plan, the spine contains the 8 LEDs that go around my head, and four that visually connect the chest to the legs. When I put it together though, I needed to create some slack in the ribbon cable, so that there’s no tension on the connectors. This was going to make it difficult to get those last four LEDs to be spaced right, and to face forward. So I decided to tap off a fourth mini-harness to hold just those four LEDs. As usual, I prototyped it on MiniMe so I could know exactly how the connectors would be arranged. Here’s the MiniMe proto. I’ve caught some bug that’s going around the office. I feel worse today than yesterday. And I’m not much in the mood to work on the suit. But I snapped this pic last night with 46 out of 50 LEDs mounted on my body. The only missing LEDs are the four spine LEDs that visually connect the chest section to the legs. This deliberately underexposed picture has all the LEDs showing white at the lowest possible brightness (i.e. RGB 0x010101). 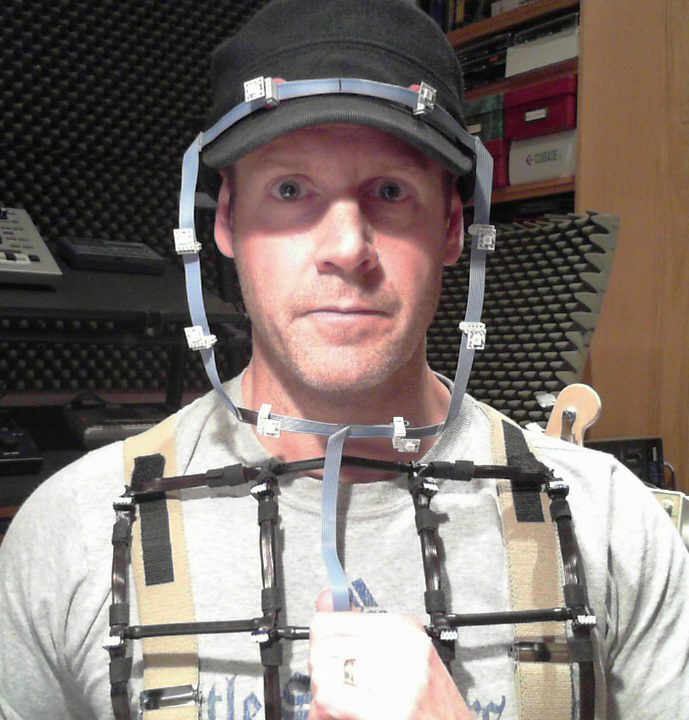 Here’s the head part of the head and spine harness. This is in many ways the most important harness in anthrolume because it acts as the electrical backbone for the other three harnesses (arms, legs, and chest). It has eight LEDs around my face, as shown, and another four down below. The lower part of the harness isn’t done yet. I have to be extra thoughtful about exactly where the other harnesses attach, and where the spine attaches to the Arduino, which will be belt-mounted. I’m using some new material in this harness as well. I’m using this crazy-strong double-sided foam tape to hold the right-angle ribbon folds together, and I’m using little wedges of cosmetics foam to push out the two LEDs on my hat. The harness attaches up there with velcro in three places. I had a really good experience using polyethylene (PE) for the chest frame. I’ve really warmed up to that stuff. I went to a plastics shop today and they had a bunch of PE boxes. None was the perfect size for the Arduino Mega + protoshield, but there was a box that had dividers molded into it that was pretty damn close. So I bought one (PE is cheap!) and cut the dividers out with a flush-cutter. It closes, but it’s a little too snug with this particular protoshield on it. I’m going to build a new one that doesn’t use the pass-through headers, and will use lower-profile LEDs. Then it will fit with plenty of room. Getting power into there will still be a challenge, but I like the form factor. Smaller is better, since this has to mount on my belt.